ISSUE 6: What Lies Beneath? 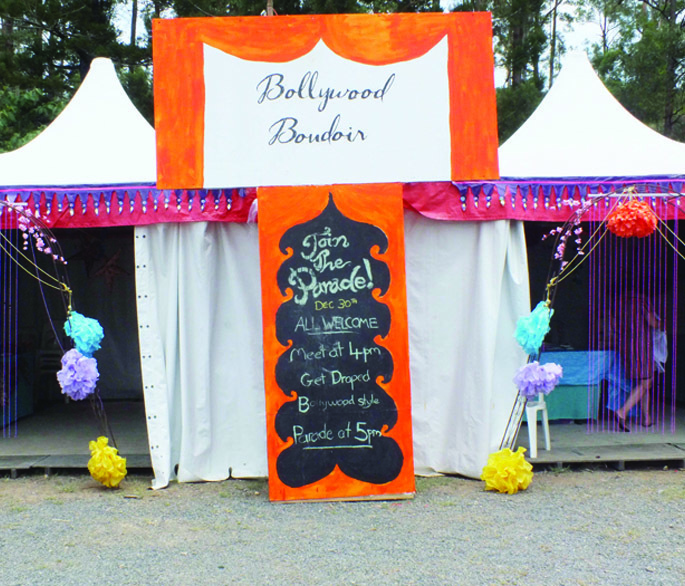 eARTh travelled to the Woodford World Folk Festival and what we found was the subterranean world of Artisania, a place housing an array of diverse art and craft workshops. It is here that we came across, Tiffany Beckwith-Skinner, Rene Bahloo and the Brown Owls. Of Japanese American heritage, Tiffany has worked on multiple film, theatre and fashion projects across the world. As an experienced stylist, costume maker, makeup and hair artist specialising in theatre, film and fashion she is a gifted facilitator who will tease out your artistic creativity. Her ‘Sunbird’, ‘Alter-Hour’ and ‘Decorative Parasol’ workshops were a hit. The sunbird, an original design, is a light-winged jacket beautifully protecting shoulders from the sun or cool breezes which Tiffany tailors to your form and you embellish, paint, appliqué and embroider to produce a beautiful memento of Woodford. ‘Alter-Hour’ provided a space to transform an existing garment into something new, those needing to fix a beloved item of clothing could hang out with creative stitchers. ‘Decorative Parasol’ workshopping saw Tiffany use a range of techniques for participants to create a unique parasol – focusing on bright, beautiful Indian prints and colours it meant joining in with the Bollywood Parade or just enjoying the shade of the bespoke parasol. Brown Owls are a crafty club who meet monthly at various locations to learn a new craft or bring along their own craft to do. It’s all about sharing crafty knowledge and skills, meeting crafty people and having a cuppa. Their ‘17th Century Fabric Buttons’ sessions allow participants to discover the traditional craft of covered button making to create fabric brooches or buttons. For lovers of 100 percent handmade it means no glues or quick assemble tools are allowed and is all about slowing down and valuing the time and skills involved in this age old craft. 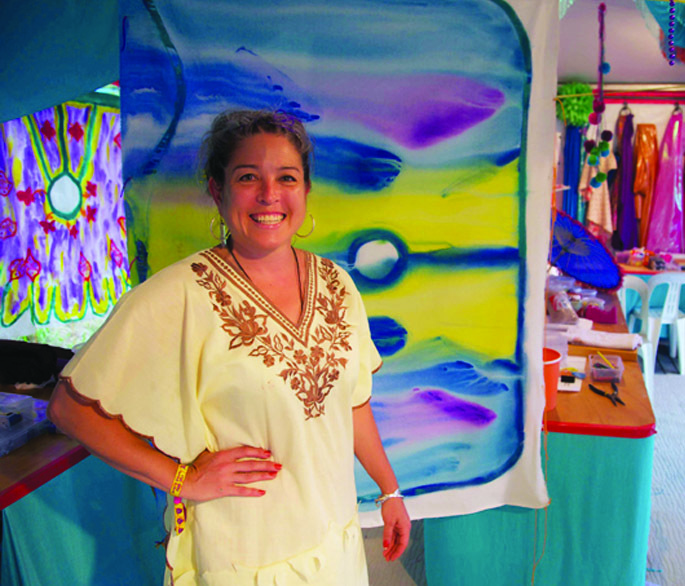 Rene Bahloo’s Weavery is a mind and art space from which Rene shares her weaving wisdom with the world through workshops. From teaching simple basketry skills paralleled with practical life philosophies her Nest Basket with Palm Fibre workshop allows you to weave your own mariposa-style coil stitch wearable pendant basketling. These are made in two parts that are sewn together, and are meant for sharing at pivotal moments in life, like coming-of-age, childbirth, or other special times. 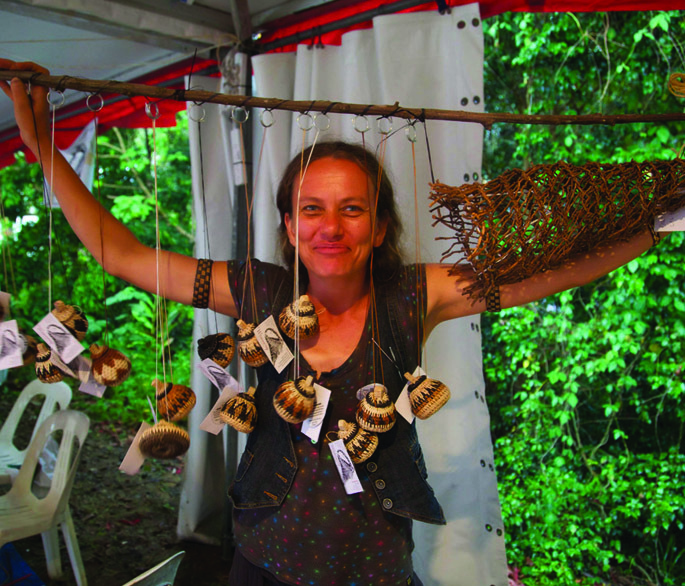 Her ‘Nest Baskets’ workshops are the means to weaving a nest basket to house your own bromeliad or orchid. Learn how to recycle those pesky palm fronds into an amazing creation. See how weaving can show you a way of being in the world, in tune with your inner nature. Rene Bahloo of Weavery shares the wisdom of weaving through engaging, connecting and fun workshops.